So a few weeks ago we talked about my love of salted caramel and I posted a recipe for salted caramel petit fours. Then last week on GBBO there was a traybake challenge. So far this series I am trying to make something from each episode and the traybakes got me thinking. I have been on the hunt for a good brownie recipe for ages and so far the ones I have tried are either too bitter or too spongy or just not quite right. 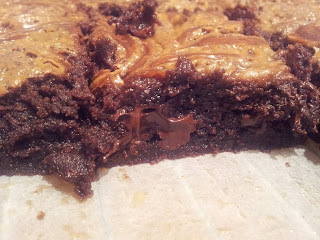 Yes, I know I'm fussy but I want proper gooey fudgy brownies. 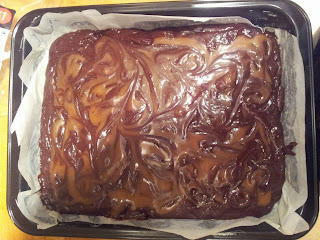 I decided I needed to add salted caramel to them as everything chocolatey tastes better with it added. 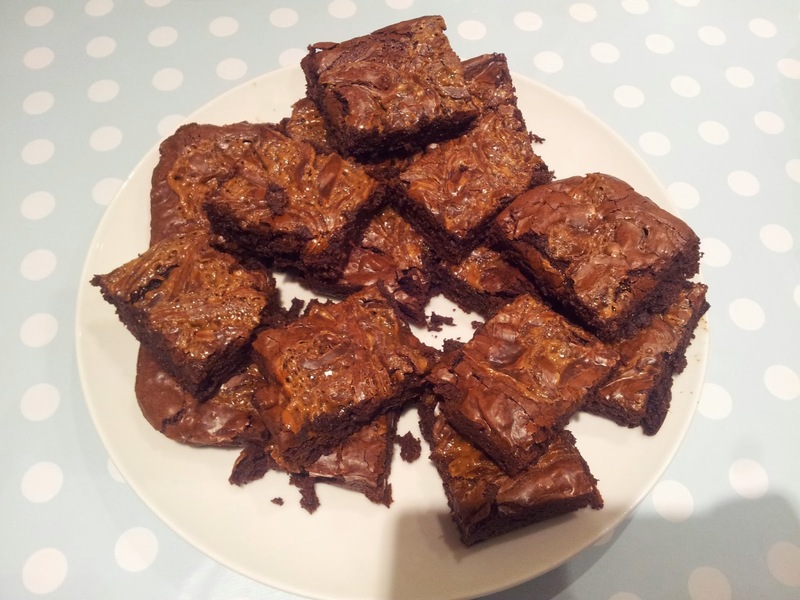 Now I have tried s/c brownies before but I felt let down on the brownie bit, it just didn't hit the spot so I have been determined to make something that is chewy, gooey, fudgy and just all kinds of wonderful. After asking on Twitter and doing a bit of googling one recipe kept popping up from the BBC Good Food website but after reading through it I felt it needed a few wee tweaks. The main one being swapping caster sugar for soft brown sugar. I was busting to get making it over the weekend but between one thing and another I didn't get to make it til Sunday eve but oh my, I think I have cracked it. The only change I will make next time is to use all the caramel. I was cautious about there being too much but let's be honest, you can never have too much of a good thing especially where salted caramel is concerned. I brought these into work the next day and they didn't last long. 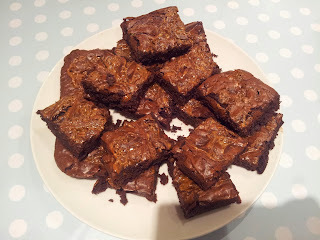 I now need another excuse to make them again! 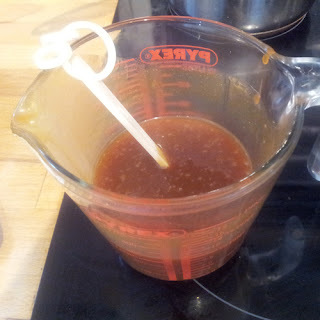 Now pour all the mixture into a measuring jug and add 1tsp of salt and leave to cool. 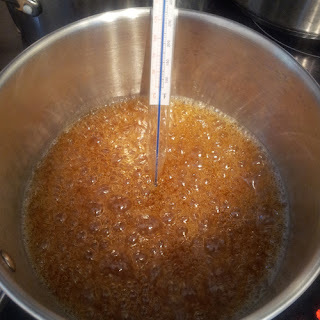 Once cool taste the caramel and add more salt if needed. Place the butter and 200g of chocolate in a bowl above a pan of simmering water, stirring occasionally until it melts. While the butter and chocolate is doing its melting thing add the eggs and sugar to a bowl and whisk. You will need a mixer or electric whisk to do this as they need to be whisked for about 5 mins until pale in colour and doubled in volume. Fold the melted chocolate and butter into the eggy sugar mixture and then sift in the flour and cocoa. Bash the rest of the chocolate with a rolling pin into small chunks. Add the chocolate chunks to the mixture and pour into the prepared tin. Pour the salted caramel over the top of the mixture and using the tip of a knife swirl it into it. Place in the oven for 30-35 mins. 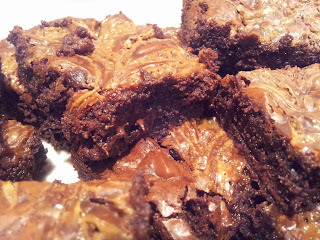 And that's it - super amazing brownies. I dare you to eat only one! I have also linked this post over at the Bakers Anonymous page.